After several months of historic calm, stocks sold off sharply last week. Rising interest rates and trade war fears were cited as the primary causes of the sell-off that caused the Dow Jones Industrial Average to drop more than 1300 points on Wednesday and Thursday combined. Concerns about corporate profit margins peaking and a potentially overcrowded tech trade also likely played a role in upsetting a market that had been extraordinarily calm over the past six months. 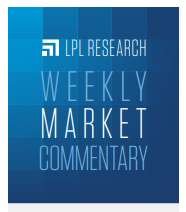 The S&P 500 Index did manage to pare losses, thanks to solid gains on Friday, but still ended the week down over 4%, for the worst week since March. Here we share some perspective on the latest bout of market volatility, which is not particularly unusual, and share our thoughts on where stocks may go from here. This volatility should not be all that surprising, for a number of reasons. Going back to 1950, no month has seen more 1% changes in the S&P 500 (up or down) than the month of October. Stocks were coming off of one of the least volatile third quarters in many decades. 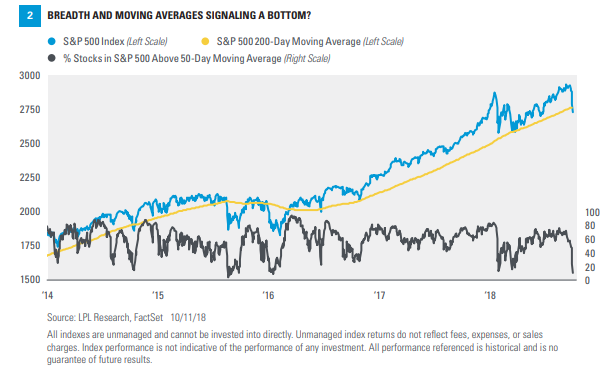 Last week’s slide means the S&P 500 has endured three pullbacks of 5–10% this year, which is in line with the long-term average.And, volatility ahead of elections is not unusual. In fact, ahead of the November 2016 presidential election the S&P 500 fell nine consecutive days—one of the longest losing streaks ever. So while pullbacks are unwelcome, they are a normal part of long-term investing. One of our favorite charts highlights this point [Figure 1]. The S&P 500 has produced a positive total return (with dividends) in 33 of the past 39 years going back to 1980. During that period, the average maximum peak-to-trough decline in the index was 14%. 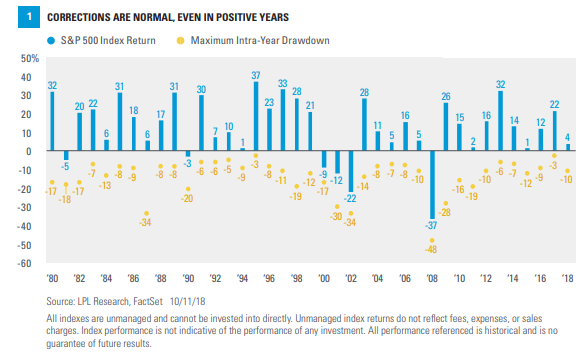 Even during positive years, the average maximum drawdown in the index was 11%. The correction in January and February of this year was about 11%, right in line with the average correction during positive years. We obviously don’t know where stocks go from here, but at this point we would say that last week’s volatility is not particularly unusual. Stocks and interest rates can rise together if… stronger economic growth is driving rates, as we believe is the case now. When rates spike over a short period of time, as in the “taper tantrum” in 2013, volatility usually spikes as well. However, we think much of the increase in interest rates is now behind us and additional moves higher should be gradual, which should enable stocks to settle down in fairly short order. Despite losses in many fixed income sectors this year, we continue to believe bonds can play important roles in portfolios as diversifiers. Despite tough rhetoric from both sides, we see a a U.S.-China trade deal as likely. Though a deal will not happen until after the midterms, we believe the two parties have too much to lose to not find middle ground. Regardless, the amount of fiscal stimulus put into place in the U.S. this year should far outweigh the dollar amount of tariffs either implemented or threatened.